← Ben & Jerry’s to Phase Out All Single-Use Plastic Utensils Worldwide! This has been one of the worst weeks in Zimbabwe for many years and has left us shocked, frightened and very uncertain about what is happening and what lies ahead for us in the coming days and weeks. I am writing this letter from Zimbabwe during a brief window in which a court order has just been granted to re-open access to the internet but not to social media sites and communication Apps. We all know this window to the world will not last. It has been almost impossible to follow what has been going on for most of this week. On Monday, Tuesday and Wednesday it was mostly too dangerous for people to venture out of their homes. A three day stayaway called by the Congress of Trade Unions and other civic groups rapidly spiraled out of control on Monday: violent protests, burning vehicles and buildings, looting shops, barricaded roads and vigilante groups running riot in our towns and cities. Many people reported hearing gun shots, helicopters hovering and pillars of black smoke rising. On Monday and early on Tuesday many thousands of messages about what was going on and what people were seeing, flooded social media, along with horrific pictures and videos showing destruction, looting, injured and dead people and a massive crackdown by police and soldiers. By about 9.00 am on Tuesday morning the government ordered the internet to be shut down and then we were in the dark about what was going on, and so was the world. The silence of our phones and computers was very frightening. We had no way of knowing who was in trouble, who needed help, if it was safe to go out, if we’d be able to get back home if we did venture out; if our children at school were OK, if our friends in other parts of the country were OK.
By Wednesday we heard that over 600 people had been arrested including Pastor Evan Mawarire who led the This Flag movement in 2017. We still don’t know officially how many people have died in the past few days. We have heard that doctors handled 68 gunshot wounds and over 170 injuries. There are thousands of stories and eye witness accounts that cannot be told now. On Thursday and Friday people have ventured out, restocked as many groceries as they can find and afford and about 50% of shops are still closed. In my home town today there are riot police and armed soldiers on the streets, outside the supermarkets that are open and at the road blocks out of town. The sight of armed soldiers in our towns is very un-nerving. There are big gaps on supermarket shelves where goods have not been restocked because delivery trucks have not been coming from Harare. Vegetables and perishable goods are in short supply, there is no bread and we have not had water for a week. 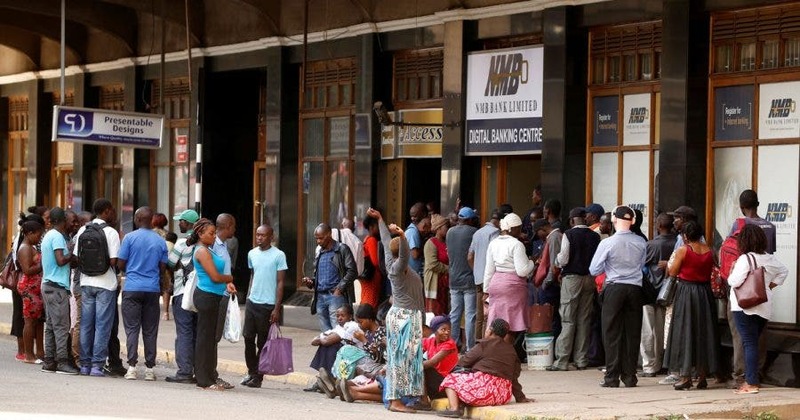 During ongoing internet blackouts we are unable to use our bank cards at many outlets as they require internet connections; we cannot pay for essential services, cannot pay wages, cannot contact our families, cannot keep up with national developments. We do not know what next week holds for us, we do not know what tomorrow holds; we do not even know if the internet will still be on by tomorrow morning. The silencing of our voices is very chilling. Please keep Zimbabwe in your hearts, thoughts and prayers in this very frightening time in our country. I will write again when I can and thank you for reading these letters and my books about life in Zimbabwe, until next time, love Cathy. 18 January 2019. Subscribe to Cathy Buckle’s letters by contacting contact cbuckle.zim@gmail.com or cbuckle@zol.co.zw. Follow Cathy Buckle on Facebook here. Cathy Buckle’s new books are ‘Finding our Voices’ and ‘When Winners Are Losers’. Other books by Buckle include ‘Sleeping like a Hare’, ‘Millions, Billions, Trillions’, ‘Can You Hear the Drums’, ‘Innocent Victims’, ‘African Tears’, ‘Beyond Tears, ‘Rundi’ and ‘Imire’. Very scary – and not really in the Western news at all. Reading the blogs of those in other counties has be an important way I learn about things the itself very biased and myopic American news outlets don’t seem worthy of airtime. My thoughts exactly. Sometimes I wonder where people’s priorities are. “Myopic” – perfect word choice. Sometimes the news is so daunting, i skip it but i am very concerned about my neighbours and actively sourced news. Thank you Ian, im so glad you did. The world needs to know. I agree Ian, the world has a right to know. We are all supposed to be one. Humanity is suffering. So true …. Peace be with you …. Please visit Ace News services. Ian has a good grip on the news. Why is there social unrest? Thank you for posting this. There is no reporting of this in the U.S. and we have no idea what is happening. I posted two links to Abhi which is in the general comments. I am praying for them! Thank you for sharing this! God bless you! Such fear and panic, my heart bleeds for them. There have been little TV crawls of something, but no real attention. Thanks for sharing. Im glad i did. Prayer is needed for them and resources too, but how to help, is another story. Very scary. It was in the news in UK for a while at the beginning of the week, but has dropped out now. They are hiding the truth. I posted in the comments a couple of links in reply to Abhi and Ken. I wish they had another choice besides “Like” for this site. I don’t want to give power to that word about what you described here. I didn’t click like for that reason but I wanted to thank you for having the courage to write about this so someone like me who isn’t following news much these days could see this. Why is this still happening in our modern world I don’t know. Politics, greed. Starvation, those poor people are struggling to survive in such harsh circumstances. I have been wanting to write about Zim but this touching letter in a window of release is heartfelt and true, she said it the way it is. I didn’t know how frightening things had become. Free speech is a person’s right and shouldn’t be taken away. No one should have to live in fear and wonder about the necessities of food and water. I admire her courage to write this letter so the world can see what is going on. I wish we as members of humanity weren’t so cruel to each other. I pray for her safety and country to find peace. See the horrors and imagine their fear. My heart is heavy with dread and we pray. Yes, that is key to the humanitarian afford needed there. I know what you mean. We are neighbours and are privy to more. Will post in future if only tp bring awareness and unite in prayer and outreach. Thank you Rosaliene. I cringe at family members overseas who know that their loved ones are there but are helpless to assist. Thank you for letting us know what is going on. I will be praying. Thank you. From our mouths to God’s ears to stay the hands of violence and instil some empathy, to share and share alike. Thank you for sharing this. Not really discussed on this side of the world. Things like this must be brought to everyone’s awareness. Wow…how horrific for these people. Nothing on tv about this situation in Australia. No, they do not want to reveal the rot. When I saw this article from Cathy, I had to share. Thank you for sharing this, it’s so scary and also eye opening. This is really, really sad. Thanks for the update Kavitha. How awful! People can be so cruel to others!!! I just fear the worst for then. I wish wordpress had more options than like. I clicked like to show my support but actually it makes me sad to think about the turmoil in Zimbabwe. I prayed for for Cathy and Zimbabwe after i read your post. Thank you for sharing it. Frightening, makes life in the UK seem perfect. Thanks for getting the letter out there. Hopefully I can follow up with better news soon Lawrence. Oh, my! So sad and scary. So heart breaking, and this is the first I’m hearing of it…..will lift the country up in prayer. Thank you, its all we can do right now. Thank God that prayer can do wonders….may His will be done. Thank you for posting. This is very scary – and we are not hearing about it in the US. Selective media news. Hate that. We have a right to know hence the window of opportunity Holly.